I am always looking for another good way to add another stream of income. When something catches my eye I do a lot of research to see if it would be a good fit for our operation. One day I stumbled onto a story that I just couldn’t get out of my head. The more I researched it, the more it made sense to me to give it a try. Mushrooms!! Not the kind made famous in the 70’s, but the kind that are showing up in farmers markets across the country. There are many different kind of edible mushrooms but the most popular are different varieties of Oyster mushrooms, Shiitake mushrooms, and Lion’s Mane mushrooms. These are often referred to as gourmet mushrooms and are not usually available in local grocery stores because these varieties are delicate and do not ship well. Europe and Asia have had a large industry farming gourmet mushrooms for many years. In some 3rd world communities mushrooms are a great source of food and revenue. But in the United States, we have been slow to grasp the value of mushrooms. In recent years the U.S. has slowly been increasing its consumption of mushrooms, making now a perfect time to get into this industry. I could write a book from what I have learned about the health benefits of mushrooms. They have been studied for heart health, diabetic health, nerve health, and for their anti- tumor properties. Eastern Medicine is full of references to different mushrooms. Mushrooms have even been found in archeological studies of ancient cultures. I have also learned that the gourmet types that are raised are included on the list of mushroom that are known to improve health. 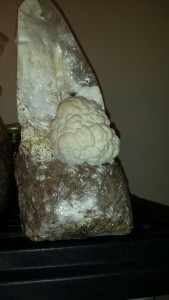 I have chose several varieties that I will be growing, but I have started with Lion’s Mane (Hericium erinaceus). Lion’s Mane is a very aggressive grower and it loves to produce the fruit that we eat. I have been told that the flavor is reminiscent of lobster, but it reminded me of eating morels as a kid. 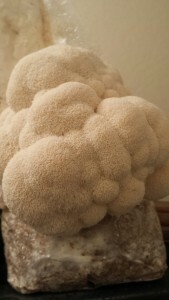 Lion’s mane in nature grows on hardwood trees. This year I saw one while deer hunting in Southern Missouri, so they are also a local mushroom for most people and can be wild harvested. I will be growing mine on hardwood pellets with supplements in a bag. 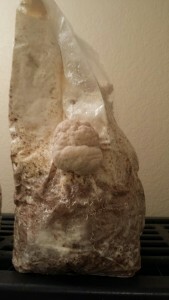 The mushroom forms a mat of mycelium in and around the hardwood sawdust in the bag. After it has fully colonized the bag, it ready to fruit. 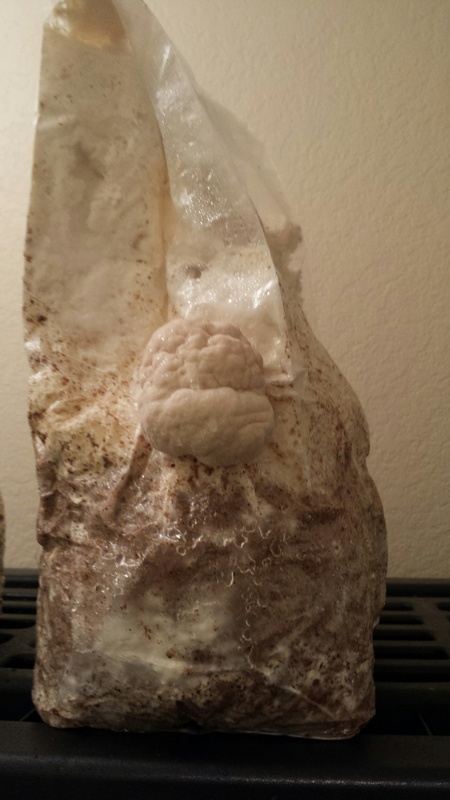 By cutting a small slit in the bag the concentration of oxygen spurs the mushroom to fruit. 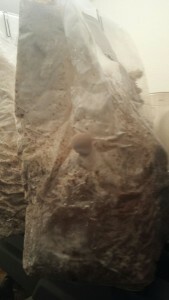 It starts to grow outside of the bag. In the picture, there is a small ball on the front of the bag. 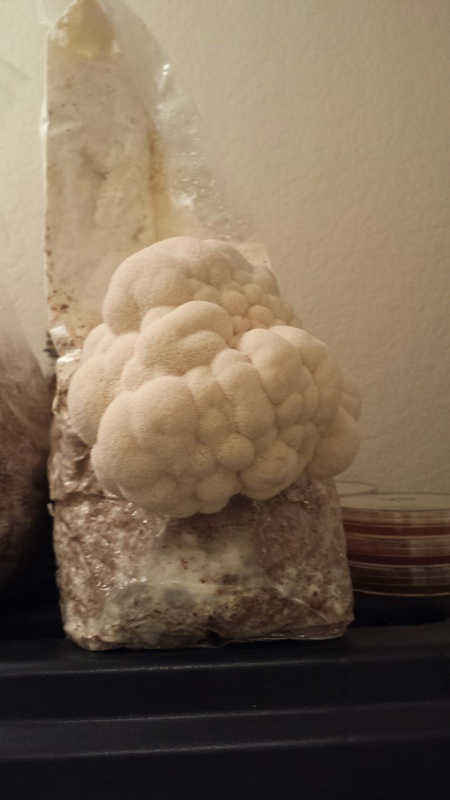 That initial start will grow to beautiful mushroom. It takes several days to grow to full maturity. While it is growing it is important give it a small misting to keep it moist and hydrated. 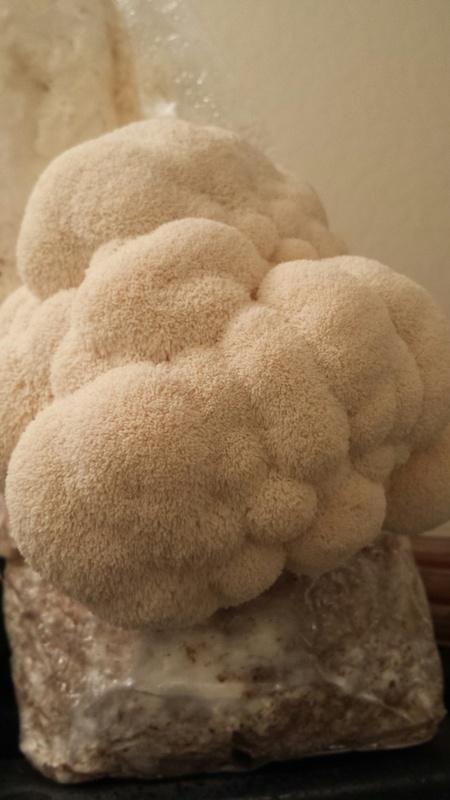 Lion’s mane, when young looks like a cauliflower. Wow, it just keeps growing. 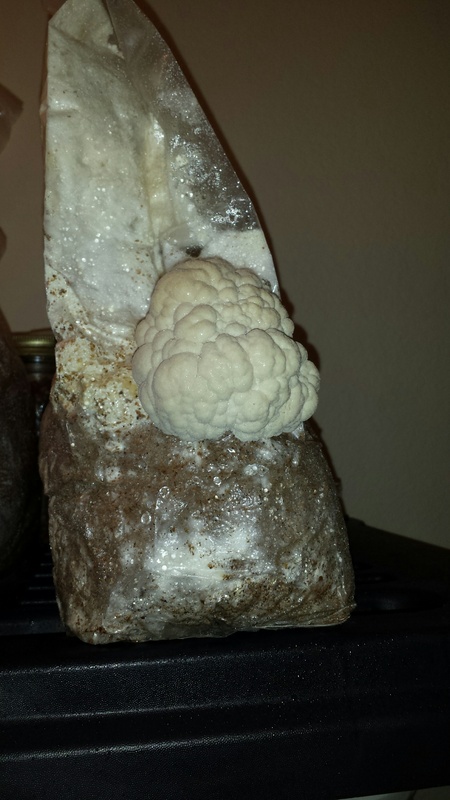 Boy, this mushroom is looking great!! Almost a week of growth. You can see the hair like projections starting to grow. When fully mature these hairs will flow down giving it a mane like look, Hence the name Lion’s Mane. This project is just begun and I am so excited to expand the operation. I am also excited to finally be able use my degree in Biotechnology to to benefit the farm.